Do you want to upgrade your home and increase its value at the same time? Take a look at these simple home improvements to inspire you to update your old interior. Are you planning on putting your home on the market or just want to better appreciate coming home every day? You may not realize how much you’ll benefit from making minor upgrades. The fact is, simple home improvements can do great things for the look and feel of your home. From increasing your homes curb appeal to making you and your family more comfortable, taking on small upgrades really pays off. However, you may feel overwhelmed when thinking about where to start. There’s a good chance you have ideas for every room in your house, but that would mean a serious investment. Instead, try keeping it simple by approaching one project at a time. Eventually, the upgrades you make will pay off. To help you get started, let’s looks at ten easy home upgrades to get your creative juices flowing. The kitchen is one of the most popular rooms in your home. Is yours looking a little bland and outdated? Making upgrades to your kitchen cabinets drastically changes the atmosphere and adds a great deal of value. The great thing is, you don’t have to buy brand new ones. Simply applying a fresh coat of paint can work wonders for your cabinets. Aside from making them look new, you can choose a more trendy color and give your kitchen a modern feel. After that, add some new handles to all the cabinets and drawers. There are countless models to choose from at reasonable prices. Applying new paint is one of the easiest and fastest ways to completely change the entire feel of your home. This is something you can do yourself or hire a contractor to take care of. Either way, you won’t be spending too much. Make sure you consider your color options before starting the project. Get some samples and paint a small portion of a wall to see if you like it. 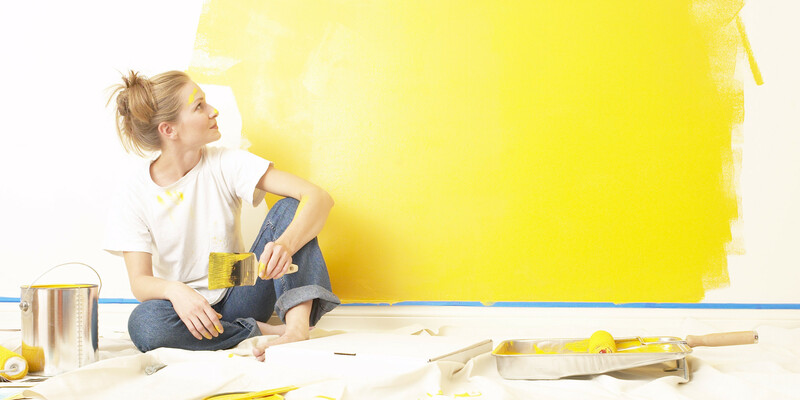 Look online for interior painting ideas, such as only painting one wall in a room a different color. To make a better transition from the inside of your home to the backyard, consider putting in a deck. This will give you and your family a place to hang out and also adds to the aesthetic of your yard. If you have a knack for big DIY projects, take this on yourself. If not, save a little and have a professional do the job. The investment will pay off, as a deck adds great value to any home. Make sure you use good materials and don’t be scared to get creative with the design. Putting new windows in your home has a number of benefits. First, if your current windows aren’t properly keeping out the hot and cold weather, you’ll save on energy bills. Second, you’ll have the ability to change the look of your home, both inside and out. You have many options when choosing new windows, so make sure to take your time when deciding what would match your existing interior design. This job is best performed by a professional, so shop around for a contractor that charges a fair rate. Giving the outside of your home a makeover drastically increases your homes curb appeal. It also makes for a great environment you can feel proud of. If there’s not much going on in your front yard, consider putting in a flower bed. You could also add a stone walkway with track lighting. You should make sure your grass is healthy. If you have patches of dead grass or areas of no grass at all, consider fertilizing or reseeding your lawn. Lighting has a huge effect on the feel of a room. Harsh, fluorescent lighting can be uncomfortable and actually increase stress levels. Instead, give ambient lighting a try for community rooms and task lighting where needed. You can also add stylish lighting fixtures to improve the aesthetic and value of your home. If your house is two-storied, consider a staircase chandelier. Your kitchen is also a great place to add track lighting. You can start with the larger rooms in your home and then move to the bedrooms. That way you’re not spending too much at once. Adding backsplash tile to your kitchen helps add style and can create a feeling of openness. This is something many buyers look for. A backsplash is a classic design element for the kitchen and can really go a long way if you choose a unique design. Adding backsplash is also something you can do yourself with a little education. Ask your home improvement store for advice and also check out YouTube videos before starting. Doing simple home improvements to a bathroom can really help the overall flow of your interior design. Plus, because bathrooms get so much use, it’s necessary to make upgrades every few years. Start with simple upgrades to the sink and vanity fixtures. If your toilet is outdated, a new one isn’t too expensive and is easy to install. Make sure and add new paint to the walls. If you want to go big, consider replacing the tub with something more appealing. If you want to add a new room, a converted attic may be your best bet. You could turn your existing attic into another bedroom or entertainment space. This will add extra appeal if you plan to sell and give you more space if your family is growing. An attic conversion is a bigger investment but can be completed by professionals fairly quickly. Another easy way to boost your homes curb appeal is to spruce up the front entrance. A new front door seems like a minor addition, but the effect it has is huge. Consider something flashier, like a bold color or design. You can also make small renovations to your front porch. Consider a porch swing, plants, or custom address numbers. Whether you’re looking to sell in the near future or just want to take control of the design of your home, making simple home improvements can go a long way. Remember to start small. Don’t try to complete everything at once. Pick your favorite upgrade for the list above and go from there. By the way, buying a new Aicool Smart Trash Can is also a good idea to add value to your home.